Check through the historical and religious highlights of Cairo in a whistle-stop 2-day tour of Egypt’s capital, with overnight hotel accommodation, transport and guided visits included. Marvel at the Great Pyramids and Sphinx of Giza; visit the spectacular Egyptian Museum to see Tutankhamun’s treasures and other age-old artifacts; and tour Old Cairo to admire Coptic churches, the Ben Ezra Synagogue, and Islamic mosques and monuments. 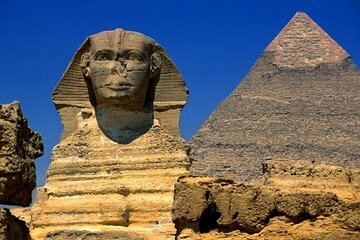 Learn the stories behind each sight from a qualified Egyptologist guide, and relax with breakfast and round-trip airport transfers.